You might not guess so since one might think of the snowy peaked mountains like Mount Everest that grace Nepal, but the country is indeed home to between 163–253 Bengal Tigers. We named our new journal in hopes or raising awareness of these beautiful, yet endangered creatures. 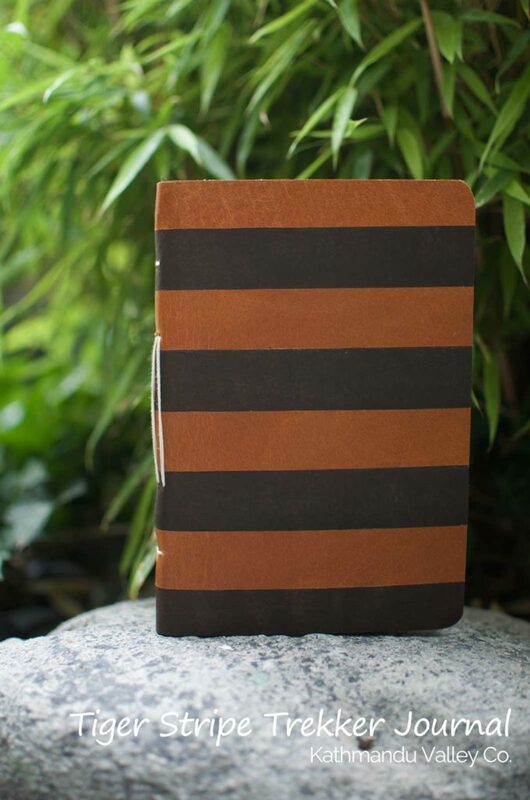 The Tiger Stripe journal’s paper has a history dating back over 1,000 years in Nepal. The special lokta paper is handmade from cuttings of Lokta bushes. The fibrous inner bark is cooked into a mash and then hand-applied to boxed screens and set to dry in the Himalayan sun, creating one of the most sought-after handmade papers. The process has been in use for centuries upon centuries in Nepal. The paper is unique, textured, and full of rough edges…just like life. The water buffalo leather strips are vegetable tanned using black walnut husks for the dark brown strips and mimosa bark for the lighter strips.